The Hatchetfish derives its name from the shape of its body that is distinct and resembles that of a hatchet. It is a member of the family Sternoptychidae which consists of deep sea fishes. According to research findings, there are about 45 species of Hatchetfish out there varying in size from one inch to about 6 inches in length. Their bodies are conspicuously thin resembling the blade of a hatchet. The fresh water varieties of Hatchetfish are usually favorites of fish keepers. The Hatchetfishes are mostly found in temperate waters at depths of between 600 and 4,500 feet. 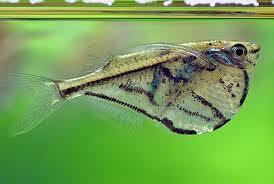 DescriptionThe Argyropelecus gigas is the largest species of the Hatchetfish and it frequents ocean depths. It grows to a length of about 12 centimeters. This may not seem like a big size when compared to other types of fish but in its family, this qualifies it to be the largest. The smaller varieties of Hatchetfish are usually covered with scales that are silvery in color. The eyes of some of the members of the Sternoptychidae family are tubular and point upwards. This enables them to be positioned strategically as they search for food that falls from above. Their eyes have a high sensitivity to light. This is because of the fact that they live in depths that have low light intensities. One of the outstanding ability that characterizes the Hatchetfish is that they are capable of producing their own light. They do this through organs that are called photophores. These organs run along the entire length of their bodies. The mechanism through which the light is produced is similar to that of fire flies. These lights are believed to play a very significant role in the mating process. The Hatchetfish are believed to have a short lifespan that lasts less than one year although research is yet to prove this proposition. They usually move from the deep waters to the shallow ends so as to feed. Their main foods include fish and plankton.